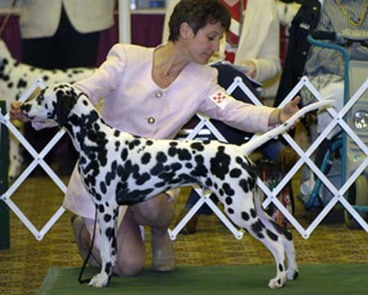 Out of the 2003 Halloween litter, Boo started off with a bang, winning the 6-8 month sweepstakes class and the 6-9 month puppy class and Reserve Winner's Dog at the 2003 Dalmatian Club of America's National Specialty. 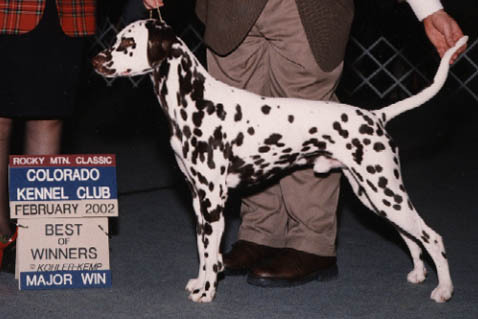 Boo was also Winner's Dog and Best Junior in Sweepstakes at the 2004 June Mid Florida Dalmatian Club Specialty and finished his championship by the age of 11 months earning a Best Junior in Sweeps, Specialty Winner's Dog and was the youngest Dalmatian qualifier for the 2005 AKC/Eukeneuba National Championship invitational show. We are very pleased with the Boo's success as a sire. Out of Am/Can Ch U-CD U-AgI Woodwynd Tequiza at the Hardrock Am/Can CD NA RD aka Quiza on September 29, 2004 came the "holy litter. 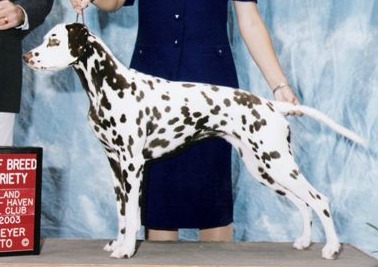 Ch Woodwynd Holy Terror aka Gracie was Boo's first Champion offspring and Woodwynd Quest For Th Holy Grail CD RA became his first performance titled kid. In November 2005, Boo started showing at UKC shows. His first two shows were a resounding success.... WD/BOW/BOB/Group I and **Reserve Best in Show** and WD/BOW/BOB/Group 1 and on to BEST IN SHOW! It was a delightful day and we couldn't be prouder. Boo is the 4th dog from Woodwynd to earn a Multi-Breed BIS win. Boo's litter out of Ch Satin N Harmony Charmed I'm Sure was born on September 11, 2005. Four kids from this litter have made us very proud - Ch Woodwynd Fair Play - Sport, BISS Ch Woodwynd Drama Queen RE CD - Diva, Ch Roundrobin Woodwynd Foxtrotter - Trotter and Ch Roundrobin Cool Jazz at Woodwynd CD RN. 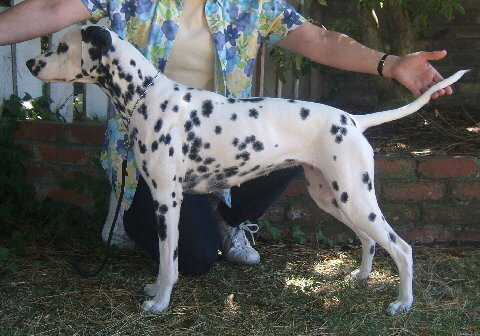 In July 2007 Boo was bred to Aberdeen Ataraxsis who is a low uric acid Dalmatian. Seven pups were born on September 17th and FOUR are LUA Dals. We are thrilled to be involved with this litter are are very excited to have Cubby (AKC/UKC GrCh/Int'l Ch Woodwnd Dotter's Eagle Scout RN BN) from this litter in Florida with us. Breeder: Mary-Lynn Jensen, Ph.D. Owner Richard Long & Mary-Lynn Jensen, Ph.D.